Slaine is a young boy of average height. He wears the uniform of the Mars Orbital Knights. 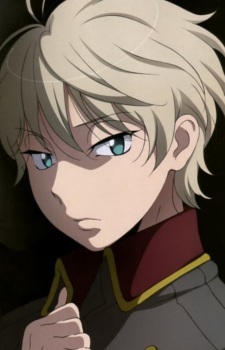 Slaine is shown to be very friendly with Princess Asseylum, being completely loyal to her. When presented with the possibility of her being alive, he boldly went after her alone. Slaine was born on Earth. His father was a scientist sent to study the ALDNOAH drives. He and his father were rescued by the royal family, having to work under them, he slowly developed a strong bond with the Princess. Because he was born on Earth, he faces a lot of discrimination from the people of Mars. After finding out Princess Asseylum was alive, he tracked her down using his only lead, an orange KG-6 Sleipnir, which was piloted by Inaho. Stealing an aircraft, he flew towards Earth where it was last sighted. After locating the mecha, he deflected a missile from the enemy Martian Kataphrakt. Assisting with Inaho's fight against the Kataphrakt, they were able to defeat it with their combined skills. However, Inaho later shot him down, fearing Slaine might have been an assassin. Recaptured by the Orbital Knights, Slaine was beaten, but did not reveal anything. After the Orbital Knights were reassured of his loyalty, they began to tend to his injuries when the base was attacked by Count Saazbaum, who had masterminded the plot to assassinate Princess Asseylum. After Saazbaum nearly kills Asseylum, he shoots and leaves Inaho for dead, while he forgives Saazbaum and gives his full loyalty to the Martians. He eventually is knighted by Count Saazbaum and now pilots the Kataphrakt Tharsis that once belonged to Cruhteo. Count Saazbaum eventually names Slaine as his son. Before a major battle against the Earth Federation, Slaine shot off a barrage of bullets, set to orbit around the Earth and hit Inaho's location in the future. However, he eventually used his trap on Count Saazbaum when Inaho is saved by Inko, for the reason that he has still not forgiven the count for attempting to kill the princess. Slaine thereby becomes Count Slaine Saazbaum Troyard.